The Global Volcanism Program has no activity reports for Yunaska. The Global Volcanism Program has no Weekly Reports available for Yunaska. The Global Volcanism Program has no Bulletin Reports available for Yunaska. The elongated, 9 x 23 km island of Yunaska in the Islands of the Four Mountains group is comprised of two unnamed volcanic centers of greatly different morphology. The older, 950-m-high western center consists of the eroded remnants of four overlapping stratovolcanoes that form a linear, NNE-trending ridge. Cinder cones and fissure-fed lava flows extend from the western end of the complex. The younger, 550-m-high eastern complex consists of a shield volcano capped by two nested calderas. 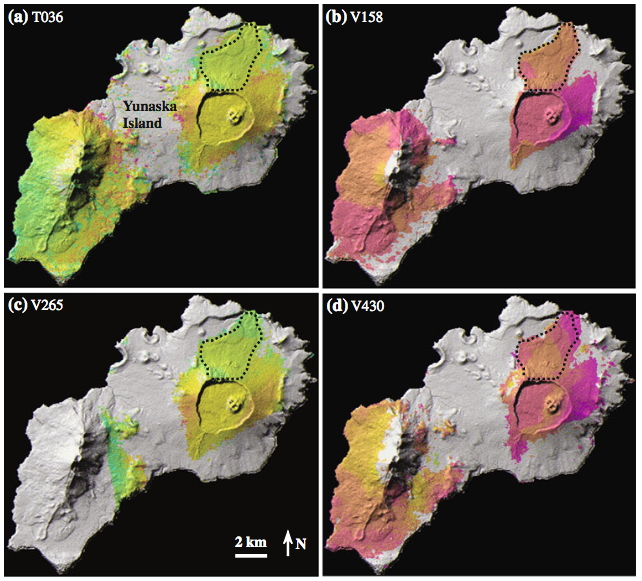 The 3.5-km-wide Coats caldera is located within an older 10 x 13 km caldera and contains cinder cones and a lava field. Two areas of particularly youthful lava flows extend down the flank through a gap in the SW caldera rim and blanket the upper northern flank of the caldera. Vents are found on the flanks of the caldera within a kilometer of its rim. A post-caldera cone is capped by a small summit crater. The eastern center is presumably the source of the island's historical eruptions, first recorded in 1817. Lamb D, Linneman S R, Myers J D, Nicolaysen K E, 1992. Caldera formation on Yunaska Island, central Aleutian arc (abs). Eos, Trans Amer Geophys Union, 73: 645. Nicolaysen K E, Myers J D, Linneman S R, Lamb D, 1992. Geologic relations of the Yunaska volcanic complex, central Aleutian arc (abs). Eos, Trans Amer Geophys Union, 73: 645. Remarks: Subsidence on the north flank due to contraction of 1937 lava flow. There is no Emissions History data available for Yunaska. 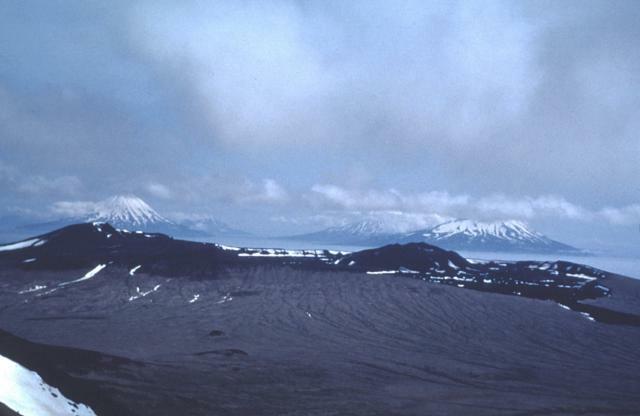 The rim of the summit caldera of Yunaska volcano is seen from an older volcanic center on the western side of the island. The younger, 550-m-high eastern complex consists of a shield volcano capped by two nested calderas and is presumably the source of the island's historical eruptions, first recorded in 1817. A young lava flow at the far right descended through a notch in the caldera rim. In the background are the snow-capped peaks (left-to-right) of Carlisle, Cleveland, and Herbert volcanoes. Photo by Jim Meyers, 1992 (University of Wyoming, courtesy of Alaska Volcano Observatory). There are no samples for Yunaska in the Smithsonian's NMNH Department of Mineral Sciences Rock and Ore collection. Large Eruptions of Yunaska Information about large Quaternary eruptions (VEI >= 4) is cataloged in the Large Magnitude Explosive Volcanic Eruptions (LaMEVE) database of the Volcano Global Risk Identification and Analysis Project (VOGRIPA).